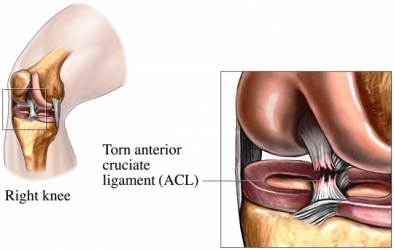 Anterior cruciate ligament (ACL) repair is done to reconstruct the ACL in the knee after it is torn. Often, a graft made of tendon is used to reconstruct the torn ligament. ACL surgery is an elective procedure. This means that surgery is not always needed; it may depend on your lifestyle and age. You may need to stop taking some medications up to 1 week before the surgery. Talk to your doctor about any medications that may need to be stopped. General anesthesia is given through an IV. You will be asleep during the procedure. Spinal anesthesia is given through the spine. The doctor may give you a sedative to keep you relaxed and ease anxiety. The range of motion of your knee will be examined to confirm the ACL tear. Next, another tendon in your knee or hamstring will be located (called autograft) to reconstruct the torn ligament. Sometimes a donor graft (called allograft) is used. The graft tendon will be formed to the correct size. 1 or 2 small keyhole incisions will be made on the top of the knee. An arthroscope (or endoscope) and tiny tools will be inserted into the knee joint. The torn ACL is removed and other damage to the knee is trimmed or repaired. In order to reconstruct the tendon, holes will be drilled through bone structures in the thigh and shin. The new graft will be placed through these holes. Needles may be threaded through the holes to suture the new tendon into place. Other devices, such as screws, washers, or staples are also used to hold the graft in place. Once the graft is securely in place, the knee’s range of motion will be tested. Other tests will be done as well. The skin will be closed with stitches. Bandages and/or a brace will be placed on the knee. This procedure is done in a hospital setting. You can usually go home the same day. If you have complications, you may need to stay longer. Monitor your vital signs as you recover from the anesthesia. Medication that prevents blood clots. Place ice packs on your knee. Show you how to use a continuous passive motion machine. Teach you how to use crutches or knee brace. Use crutches or knee brace for as long as the doctor recommends. ACL Injury: Does It Require Surgery? American Academy of Orthopaedic Surgeons website. Available at: http://orthoinfo.aaos.org/topic.cfm?topic=A00297. Updated September 2009. Accessed February 8, 2018. Anterior cruciate ligament (ACL) injury. EBSCO DynaMed Plus website. Available at: http://www.dynamed.com/topics/dmp~AN~T114675/Anterior-cruciate-ligament-ACL-injury . Updated June 26, 2017. Accessed February 8, 2018. Anterior cruciate ligament injuries. Ortho Info—American Academy of Orthopaedic Surgeons website. Available at: http://orthoinfo.aaos.org/topic.cfm?topic=A00549. Updated March 2014. Accessed February 8, 2018. Anterior cruciate ligament injuries: treatment and rehabilitation. Encyclopedia of Sports Medicine and Science website. Available at: http://sportsci.org/encyc/aclinj/aclinj.html. Accessed February 8, 2018. Knee ligament repair. Johns Hopkins Medicine website. Available at. http://www.hopkinsmedicine.org/healthlibrary/test%5Fprocedures/orthopaedic/knee%5Fligament%5Frepair%5F92,P07675/. Accessed February 8, 2018. 6/6/2011 DynaMed Plus Systematic Literature Surveillance http://www.dynamed.com/topics/dmp~AN~T905141/Treatment-for-tobacco-use : Mills E, Eyawo O, Lockhart I, Kelly S, Wu P, Ebbert JO. Smoking cessation reduces postoperative complications: a systematic review and meta-analysis. Am J Med. 2011;124(2):144-154.e8.